Curating films together for a DVD release is an interesting concept. Usually the most obvious connection between films is their director with auteur based box sets being perfectly normal in the everyday DVD buying scenario. When a DVD is released combining films with a more subtle connection, it is vital that the films have a strong relationship with each other to avoid clashes and tainting. 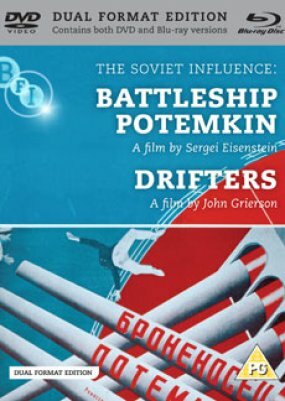 From The Soviet Influence range released by the BFI comes the second release from this range charting and effectively showing the influence of Soviet propaganda films on early British documentary and film. 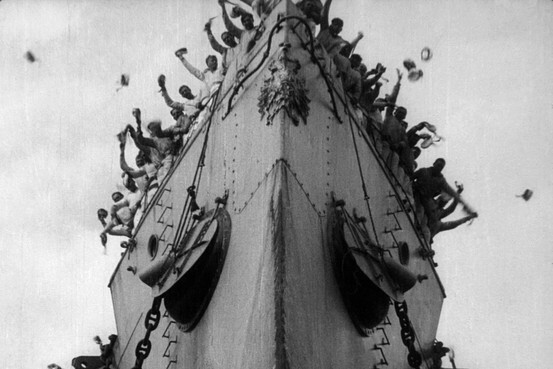 Eisenstein’s Battleship Potemkin (1925) needs little introduction with it producing perhaps more exegesis on its meaning and puzzles than perhaps any other film in history. Suffice to say though, its presence here is most thought provoking and is an excellent release judged solely on Eisenstein’s film itself. The quality of the film needs little emphasising but its restoration will be one of its key selling points. The picture looks simply sublime and Edmund Meisel’s score is as powerful as it ever was. This release however isn’t solely about Battleship Potemkin. It is as excellent a way to experience the film as any on the market but it is the films that it is paired with that make the release that bit more special than the simple vanilla discs available. Recalling the original UK screening in 1929, the release puts Potemkin next to its original double bill partner Drifters (1929) by John Grierson. Drifters is a documentary looking at the life of deep sea fishermen. However not only is the film highly dramatised and edited in a way to bring the danger elements out, the film is full of political allegory and metaphor in the form of the free market and fish being sold. It’s a theme that is only mildly present within the films presentation of the working fisherman’s hardship but there is more of Potemkin here than a theme. Visually, Drifters is full of Eisenstein like motifs with montages full of industrial mechanics and hard working machines, whether they be metal or human. The rhythms of these machines have been crafted by Grierson into a beautiful, almost musical, visual pace and this makes it a perfect partner to Potemkin. Drifters also features a brand new score composer Jason Singh. The score works though does play into the usual ambience that accompanies many silent films these days. The first few minutes of ambient drone seem little different to In The Nursery’s score to Vertov’s Man With A Movie Camera (1929) but the score picks up once the sailors are at sea and cleverly produces diegetic effects through non-diegetic music though seems crass when next to Meisel’s monumental score for Potemkin. Along with Drifters, three other short films are included, all with similar sea fairing themes. Grierson’s follow up Drifters, Granton Trawler (1934), is here and shows a similar attention to detail but with added sound. Following a Scottish community of fisherman for ten minutes adds a quaint feel to the work though perhaps the decision to use genuine fishermen to act rather than filming them normally or getting actors in is one of the short film’s few downfalls. Trade Tattoo (1937) is an exciting six minute experimental piece by Len Lye which uses colour and music to dizzying effect. Its inclusion on the release is more down to its use of footage from Drifters than any particular Soviet influence; however, its Richter like shaping and bombardment of bright, visual sound is exhilarating and belies its age of being at least fifteen years younger than pop music videos. The final film is again about the battle with the elements that sailors go through when hauling fish. Harry Watt’s North Sea (1938) is the most dramatic of the British films presented, and one that has the most in common with the jeopardy and relief of Potemkin. It also seems to have been the most reconstructed of the British films, making it the least affecting of them but is still an entertaining insight into how filmmakers tried to present truth through fiction. This Soviet Influence release more than proves its point. Like a miniature essay arguing for the influence to be there, the collection of films show a natural progression of ideas further adding to Eisenstein’s curriculum vitae of importance while still maintaining interest and enjoyment for the viewer. Volume 2 of The Soviet Influence series is out on the 5th of November. The score for drifters is entirely vocal! So ‘electronic ambience’ is way off!! Singh uses looping and effects on his voice but largely you are just hearing a very skilled use of the voice ,layered up. Thanks for the info. Changed it to just ambient even if it is technically an electronic modulation of voice. Live version is even more powerful, he adds a lot on top of the recorded version. Maîtresse – Barbet Schroeder (1976), BFI.